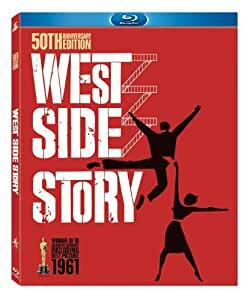 The winner of 10 Academy Awards®, this 1961 musical by choreographer Jerome Robbins and director Robert Wise (The Sound of Music) remains irresistible. Based on a smash Broadway play updating Shakespeare's Romeo and Juliet to the 1950s era of juvenile delinquency, the film stars Natalie Wood and Richard Beymer as the star-crossed lovers from different neighborhoods--and ethnicities. The film's real selling points, however, are the highly charged and inventive song-and-dance numbers, the passionate ballads, the moody sets, colorful support from Rita Moreno, and the sheer accomplishment of Hollywood talent and technology producing a film so stirring. Leonard Bernstein and Stephen Sondheim wrote the score. --Tom Keogh --This text refers to the DVD edition. What a magnificent movie! I remember attending the Canadian premier of the show, back in the spring of 1962. I had just finished directing a Glenview Park Secondary School production of the show (supported by the Galt Little Theatre, in what is now Cambridge, Ontario). Following its run, I remember being invited to the Canadian premier in Toronto, along with the choreographer Ms. Laurie Wagner. It was a great night and a stunning movie. To see it again, on this excellent Slim Case edition was truly wonderful. Having seen a number of stage production of WSS over the years, and having kept away from seeing the movie for sentimental reasons, I now wonder why I was so foolish. This movie has survived very, very well over the years. It's still deserving of its 10 Academy Awards! If you like movie musicals and haven't seen this one, treat yourself. It's really worth your money and your time. Thank you, Amazon.ca! The music is great. But as a movie the pace is slow and the performances are generally a bit disappointing, except for Rita Moreno's Anita, who shone in every scene she appeared. So many great musicals got turned into disappointing movies. My Fair Lady and The Sound of Music are two exceptions. Delighted to get this in only 24 hours. Popped it into my BluRay player which recognized the title. Will not give me anything but a black screen no matter how I try. Amazon replaced, and the new copy is perfect. WINNER OF 10 ACADEMY AWARDS TO CELEBTRATE THE TRIUMPHS AND TRAGEDIES OF THE GANGS ENGAGED IN CONSTRUCTIVE AND DESTRUCTIVE ASPECTS OF THEIR LIVES.FULL OF SONGS,MUSIC AND DANCES.OCASSION SEEMS TO BE FITTTING AS NOW BEING PLAYED IN VERY MANY THEATERS ACROSS AMERICA TO CONVEY THE MESSAGE WHEN PEACE IS PROGRESSIVE AND PROSPEROUS. This film is a masterpiece. From the music, dancing, acting and the message about hate! This is more than just a story about Romeo and Juliet or about love. It is about how hate can ruin everything that is beautiful. I recommend this to anyone who likes musicals but also dramatic pictures. 5.0 out of 5 starsBatter than the original! 5.0 out of 5 starsOne of the best musical movie by Hollywood in last 50 years. One of the best musical movie I had been watching over many many times so far in my life.